Let's take a walk through life with Yaakov Salomon. In these marvelous stories - brimming with wit, understanding, a touch of irony and a large helping of authentic Torah perspective - we will walk with a renowned and experienced psychotherapist and popular author through the pathways of contemporary life: its crowded sidewalks, its pedestrian malls, and the occasional dead end street. This is a walk through our lives that will be fun, entertaining - and eye-opening. We'll enjoy a fresh cinnamon danish from Gross's Bakery - and learn a lesson on using our time effectively. We will revel in the five-star dining room of a Pesach hotel, and gain - no, not five pounds - but a new understanding of our priorities. In Wal-Mart we'll find, not only discounted shirts and hothouse grapes, but a lesson that will help us navigate the aisles of the superstore called Life. We will meet a man struggling with gambling who finds a novel, and moving, way to beat his addiction, and we will learn from him a lesson that will serve us all well. In our full - sometimes overfull - and complex lives, Yaakov Salomon is a welcome and much-needed voice of sanity and reason. 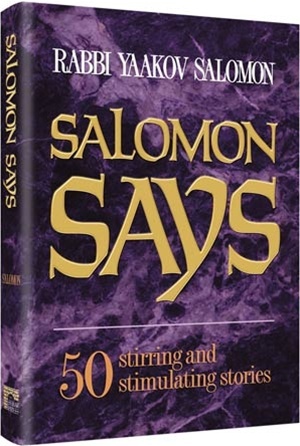 Salomon Says - a lot of things that we have to hear. He says them with humor, with humility, and with deep insight and wisdom. Salomon Says - and we will listen. And laugh. And learn.